KIND Almond Walnut Macadamia with Peanuts + Protein is a satisfying and crunchy blend of almonds, walnuts, macadamias and peanuts. Each bar contains 10 grams of protein, which promotes satiety and strengthens bones, muscles and skin. 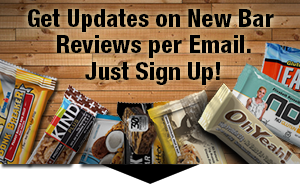 This flavor is currently the only KIND bar that meets Gluten Free Protein Bar Reviews’ minimum protein content of 10 grams. The other flavors have 7g or less (as of 07/2013). INGREDIENTS: Mixed nuts (peanuts, almonds, macadamias, walnuts, cashews, brazil nuts), honey, soy protein isolate, non GMO glucose, tapioca starch, vanilla extract, chicory root fiber, soy lecithin, salt. 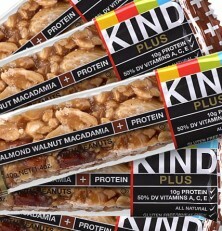 Nutrition facts based on Almond Walnut Macadamia with Peanuts + Protein flavor. Facts and ingredients vary by flavor. Flavor Peanut Butter Dark Chocolate + Protein has only 7 grams of Protein. KIND was founded on the principle of holistic kindness, and we pride ourselves on creating new paths that avoid false compromises. Instead of “Or” we say “And”. We choose healthy and tasty, convenient and wholesome, economically sustainable and socially impactful. Love these bars! Especial the ones with the dark chocolate drizzle.